BELIZE CITY, Wed. Sept. 7, 2016–Hundreds of Guatemalans have been relocated, and given lands and houses, in a program led by the Organization of American States (OAS) to peacefully address incursions and encroachments into Belizean territory, particularly in western and southern Belize. Over the course of the past year, a number of reports have surfaced, claiming continued squatting by Guatemalans on Belizean soil, including inside the Chiquibul National Park, which has strict protective status. However, latest reports from Belize Defence Force Commander, Brigadier General David Jones, indicate that all those squatters have vacated Belize, the most recent ones being a group of about 15 which have left El Retiro, where they had built 5 buildings which they have since dismantled. Three other buildings closer to Valentin camp had also been vacated, Jones indicated. We had reported on that discovery last December, when we were informed that two had been found in the region of Cebada and a third in the Valentin area, straddling the Belize-Guatemala border. In the most recent case at El Retiro, some of the squatters had been living illegally in Belize before, around the Machaquilha area, Jones told us. “They were sent back to Guatemala. They were actually given a piece of land and house in Guatemala,” he said. That happened in 2005, over 11 years ago, and according to Jones, the individuals who were given property apparently sold those places shortly afterwards and decided to return to Belizean territory to set up homes at a different location in the Chiquibul. When they were discovered, two families said they had been there for over 11 years, Jones told us. “We don’t believe it,” the Commander said. Some families had children, but they did not ever claim that their children were born in Retiro, Belize, he said. This time, the squatters relocated only a few hundred meters away from the Belize-Guatemala border, at a village called La Rejoya, suggesting that there is a strong possibility that they will come back again. “We have to continue doing patrols by air and land to try and find them. This is a big area to police,” Jones said. He told us that the BDF, which now has additional helicopters, is doing air surveillance now, and it was actually while they were flying the BDF Defender over the Chiquibul that they discovered the illegal settlement. The Organization of American States (OAS) verified that the Guatemalans were squatting in Belize, and the Government of Belize later issued them with an order to leave. Last week, when BDF soldiers went to the area to determine if the settlers had complied, they came under fire but no one was hurt, Jones indicated. He said that investigating the shooting would be difficult, since the soldiers didn’t see anyone. 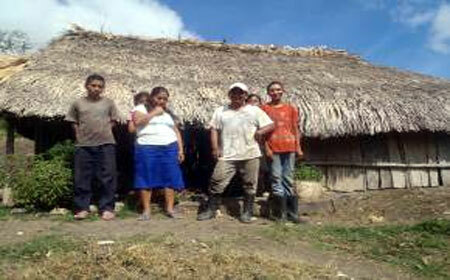 The BDF returned safely the following day and confirmed that the squatters had relocated to Guatemala. He said that after incidents such as the April incident, 40 to 50 Guatemalan villagers would have come back, and the BDF would have been forced to respond. Recently, Guatemala’s Foreign Minister, Carlos Raul Morales, has been lobbying for Belize to remove armed rangers from border patrols, and Morales has said that they intend to issue a call on the OAS to challenge Belize on the matter. “That is something for the Government of Belize. They have no say in what our government does. They can’t stop the country from having FCD [Friends for Conservation and Development] doing patrols. We will have more rangers, more Forestry personnel, more people from Ya’axche Conservation Trust—and they will all be armed. We are not going to send them in there without weapons,” General Jones said. Recently the Government of Belize announced an unprecedented investment of almost $15 million in an initiative to curb illegal activities inside the Chiquibul Forest and particularly in five protected areas in western and southern Belize. We asked Jones whether Morales could be responding to the announcements made at the launch at that initiative to have civilian rangers armed. “I am not sure if he was responding to the Chiquibul initiative. I don’t know why he made that comment. They should stop the Guatemalans from going in there and shooting at people. That is Belizean territory,” said Commander Jones. We asked Jones about the state of relations with his Guatemalan counterpart, General Carlos Eduardo Estrada Pérez. He told us that they are “still very good…” He told us that the Sarstoon talks are ongoing and the hope is for a mechanism to be agreed by year-end. According to Jones, the military aggression by the Guatemalans against Belize’s military at the Sarstoon has cooled off.